This program is designed to provide free or discounted care to those who have no means, or limited means, to pay for their medical services (uninsured or underinsured). In addition to quality health care, patients are entitled to financial counseling by someone who can understand and offer possible solutions for those who cannot pay in full. The patient account representative’s role is that of patient advocate, that is, one who works with the patient and/or guarantor to find reasonable payment alternatives. FamilyBorn Maternity and Women's Health will offer a Sliding Fee Discount Program to all who are unable to pay for their services. FamilyBorn will base program eligibility on a person’s ability to pay and will not discriminate on the basis of age, gender, race, sexual orientation, creed, religion, disability or national origin. The Federal Poverty Guidelines are used in creating and annually updating the sliding fee schedule to determine eligibility. The following guidelines are to be followed in providing the Sliding Fee Discount Program. Payment Policy Brochure will be available to all uninsured patients at the time of service. Notification of the Sliding Fee Discount Program will be offered to each patient upon admission. Sliding Fee Discount Program application will be included with collection notices sent out by FamilyBorn. An explanation of our Sliding Fee Discount Program and our application form are available on the FamilyBorn website. 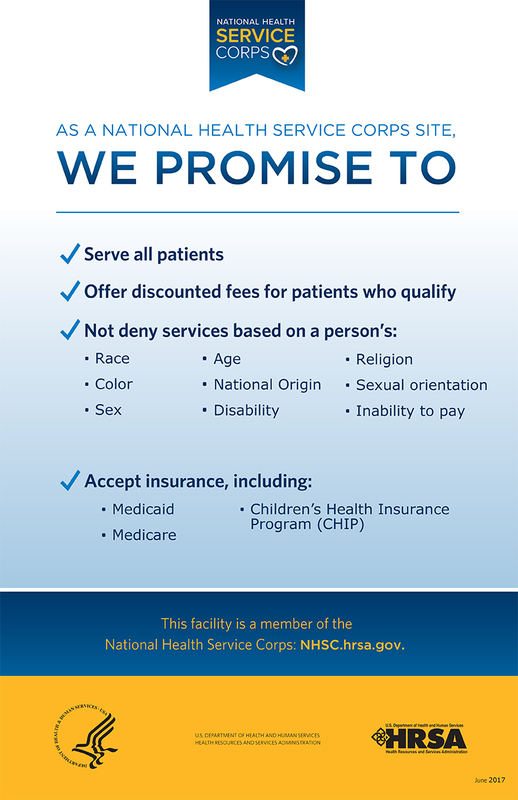 FamilyBorn places notification of Sliding Fee Discount Program in the clinic waiting area. All patients seeking health care services at FamilyBorn are assured that they will be served regardless of ability to pay. No one is refused service because of lack of financial means to pay. Request for discount: Requests for discounted services may be made by patients, family members, social services staff or others who are aware of existing financial hardship. The Sliding Fee Discount Program will only be made available for clinic visits. Information and forms can be obtained from the front desk and the business office. Administration: The Sliding Fee Discount Program procedure will be administered through the business office manager or his/her designee. Information about the Sliding Fee Discount Program policy and procedure will be provided and assistance offered for completion of the application. Dignity and confidentiality will be respected for all who seek and/or are provided charitable services. Alternative payment sources: All alternative payment resources must be exhausted, including all third-party payment from insurance(s), federal and state programs. Completion of application: The patient/responsible party must complete the Sliding Fee Discount Program application in its entirety. By signing the Sliding Fee Discount Program application, persons authorize FamilyBorn access in confirming income as disclosed on the application form. Providing false information on a Sliding Fee Discount Program application will result in all Sliding Fee Discount Program discounts being revoked and the full balance of the account(s) restored and payable immediately. If an application is unable to be processed due to the need for additional information, the applicant has two weeks from the date of notification to supply the necessary information without having the date on their application adjusted. If a patient does not provide the requested information within the two-week time period, their application will be re-dated to the date on which they supply the requested information. Any accounts turned over for collection as a result of the patient’s delay in providing information will not be considered for the Sliding Fee Discount Program. Eligibility: Discounts will be based on income and family size only. FamilyBorn uses the Census Bureau definitions of each. Family is defined as: a group of two people or more (one of whom is the householder) related by birth, marriage, or adoption and residing together; all such people (including related subfamily members) are considered as members of one family. Income includes: earnings, unemployment compensation, workers' compensation, Social Security, Supplemental Security Income, public assistance, veterans' payments, survivor benefits, pension or retirement income, interest, dividends, rents, royalties, income from estates, trusts, educational assistance, alimony, child support, assistance from outside the household, and other miscellaneous sources. Noncash benefits (such as food stamps and housing subsidies) do not count. Income verification: Applicants must provide one of the following: prior year W-2, two most recent pay stubs, letter from employer, or Form 4506-T (if W-2 not filed). Self-employed individuals will be required to submit detail of the most recent three months of income and expenses for the business. Adequate information must be made available to determine eligibility for the program. Self-declaration of income may only be used in special circumstances. Specific examples include participants who are homeless. Patients who are unable to provide written verification must provide a signed statement of income, and why (s)he is unable to provide independent verification. This statement will be presented to the FamilyBorn CEO or his/her designee for review and final determination as to the sliding fee percentage. Self-declared patients will be responsible for 100% of their charges until management determines the appropriate category. Discounts: Those with incomes at or below 100% of poverty will receive a full 100% discount. Those with incomes above 100% of poverty, but at or below 200% of poverty, will be charged according to the attached sliding fee schedule. The sliding fee schedule will be updated during the first quarter of every calendar year with the latest Federal Poverty Guidelines. Nominal fee: Patients receiving a full discount will be assessed a $10 nominal charge per visit. However, patients will not be denied services due to an inability to pay. The nominal fee is not a threshold for receiving care and thus is not a minimum fee or copayment. Waiving of charges: In certain situations, patients may not be able to pay the nominal or discount fee. Waiving of charges may only be used in special circumstances and must be approved by the FamilyBorn CEO, CFO or their designee. Any waiving of charges should be documented in the patient’s file along with an explanation (e.g., ability to pay, goodwill, health promotion event). Applicant notification: The Sliding Fee Discount Program determination will be provided to the applicant(s) in writing, and will include the percentage of Sliding Fee Discount Program write off or, if applicable, the reason for denial. If the application is approved for less than a 100% discount or denied, the patient and/or responsible party must immediately establish payment arrangements with FamilyBorn. Sliding Fee Discount Program applications cover outstanding patient balances for six months prior to application date and any balances incurred within 12 months after the approved date, unless their financial situation changes significantly. The applicant has the option to reapply after the 12 months have expired or anytime there has been a significant change in family income. When the applicant reapplies, the look back period will be the lesser of six months or the expiration of their last Sliding Fee Discount Program application. Refusal to pay: If a patient verbally expresses an unwillingness to pay or vacates the premises without paying for services, the patient will be contacted in writing regarding their payment obligations. If the patient is not on the sliding fee schedule, a copy of the Sliding Fee Discount Program application will be sent with the notice. If the patient does not make effort to pay or fails to respond within 60 days, this constitutes refusal to pay. At this point in time, FamilyBorn can explore options not limited to, but including offering the patient a payment plan, waiving of charges or referring the patient to collections. Record keeping: Information related to Sliding Fee Discount Program decisions will be maintained and preserved in a centralized confidential file located in the business office manager’s office, in an effort to preserve the dignity of those receiving free or discounted care. Applicants that have been approved for the Sliding Fee Discount Program will be logged in a password protected document on the FamilyBorn shared directory, noting names of applicants, dates of coverage and percentage of coverage. The business office manager will maintain an additional monthly log identifying Sliding Fee Discount Program recipients and dollar amounts. Denials also will be logged. Policy and procedure review: Annually, the amount of Sliding Fee Discount Program provided will be reviewed by the CEO and/or comptroller. The sliding fee schedule will be updated based on the current Federal Poverty Guidelines. Pertinent information comparing amount budgeted and actual community care provided shall serve as a guideline for future planning. This will also serve as a discussion base for reviewing possible changes in our policy and procedures and for examining institutional practices that may serve as barriers preventing eligible patients from having access to our community care provisions. Budget: During the annual budget process, an estimated amount of Sliding Fee Discount Program service will be placed into the budget as a deduction from revenue. Board approval for the Sliding Fee Discount Program will be sought as an integral part of the annual budget.